A Portland Pie Company restaurant will be moving in to the former Verve Burritos space on Main St. in Bangor. Portland Pie Company, the Portland-based pizza, sandwich and salad restaurant, will open a new location in downtown Bangor later this year. Portland Pie will open its newest location at 89 and 91 Main St. in downtown, the former location of Verve Burritos, which closed both its Bangor and Orono locations in late February and early March. Portland Pie CEO Jeff Perkins anticipates a June 2019 opening. 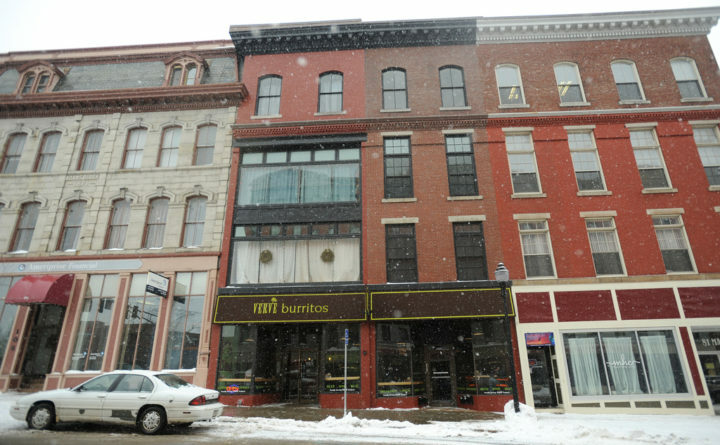 “We’re really excited to add Portland Pie as a tenant, and we know they will be a great fit for downtown Bangor,” said Heather Furth, who co-owns the building with her business partner and husband, Abe Furth. Portland Pie Company, founded in 1997, sells gourmet pizza, sandwiches and salads alongside Maine craft beer at its seven locations in Maine and New Hampshire. Since 2014 the company has rapidly expanded, opening locations in Biddeford, Brunswick and, in 2018, on Main Street in downtown Waterville. Another location in Lewiston has experienced multiple delays in opening, including a delay earlier this year due to the prolonged federal government shutdown in December and January. Portland Pie’s locations offer eat-in, takeout and delivery menu items, as well as a full bar. The company also sells pizza dough to retailers and wholesalers throughout the Northeast.